Well, yikes. Talk about a moment in life that is a perfect example of situational time management, meaning my situation has changed this past month. And the situation I find myself in right now is also an example of the thin and wobbly boundary between personal and professional life coming close to crumbling altogether. 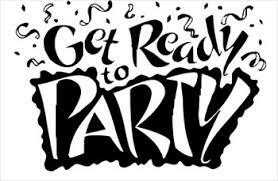 My husband is two weeks into the recovery period for shoulder surgery. We're probably looking at close to a month and a half with him having limited to no use of one arm. I wouldn't be surprised to find out it will go longer. I expected time for nursing care and planned to limit my writing to a page or two a day, do some professional reading, make some submissions. If you think that makes me sound like the pregnant women who believe that while they're on maternity leave they'll write that book they've been meaning to get to or find a cure for cancer, yeah, I couldn't agree with you more. What's happened is that I didn't realize how much the surgical patient does around here, meaning I'm spending a lot more time doing his share of keeping our ship afloat than I foresaw. We knew an older family member was going to move sometime this year. Then a few days after the surgery we learned that...Surprise!...it's going to happen in the next month or so. Prepping for the move is taking a lot of time right now, and our elder is going to need a lot of support once the move is made. Summer is nearly here, and that's a rough season for work at Chez Gauthier. Additionally, the family is expecting a new baby this fall. The last time we had a new baby around here, between baby support and dealing with older relatives I ended up working only two days a week for a few months. Which, actually, would be a great deal more than I'm doing now. I can look forward to that! Take a work break? 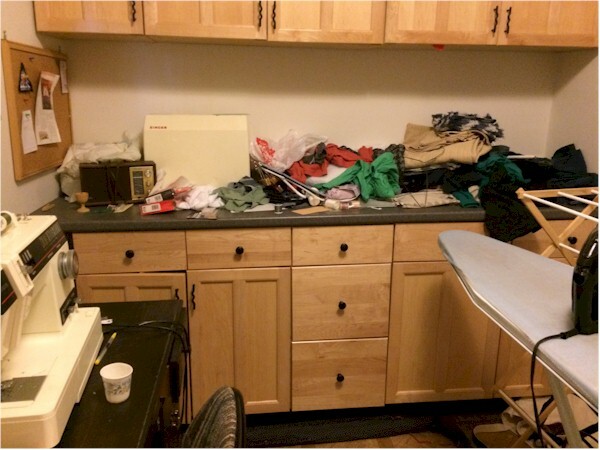 I considered taking a work break and focusing on cleaning up the personal life. My theory was that if I could get everyone and everything working well in a month or two, it would be so much easier to get back to work. However, this personal life situation is going to go on, to one degree or another, for the better part of the rest of this year. Letting myself get out of any kind of work routine at all could mean that one day I suddenly realize I'm not a writer anymore. Doing Less, Like Einstein. Instead, I'm going to focus on just one thing, like Einstein did. And what I'm going to focus on is my writing portfolio. I have material ready to submit. One of my seven goals for this year is to submit completed work. My theory (like Einstein, I have a theory! ): submitting work I've already completed will require less intense, long-term concentration than generating new work. So until family responsibilities let up, I'm purging my other goals, and concentrating on submitting. The above seems more doable in the odd moments I have to work than trying to continue working on the first draft of a novel I've started or getting started on new essays or short stories. My husband's surgery was relatively short, and he was sent out of the surgical center before noon to suffer at home. So I stayed in the waiting room that morning, and while I was there, I drafted two reader response blog posts and finished reading a professional magazine. I'm not bragging. I feel kind of bad about working under those conditions. Not as bad as I feel about going window shopping while I was waiting for my son to finish his day surgery ten years ago, but guilty nonetheless. I wasn't the only evil wife there, though, if that's any kind of defense. I know for a fact that another woman left and went grocery shopping while her husband's shoulder was being hacked up, because she told me so. Somehow scavenging for food for the family while a mate is enduring a physical ordeal seems noble while nursing a career under the same circumstances, not so much. Honest to God, I also brought food. And I ate it. Oh, well, you know what the Zenny ones say--Dwelling on the past can only lead to unhappiness. Sure don't want that. We have a few authors in the state promoting new books, as well as a few reading from older work. 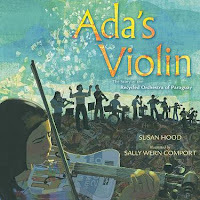 Ada's Violin by Susan Hood with illustrations by Sally Wern Comport is one of the best environmental books for kids that I've run across. It's also a great example of creative nonfiction. 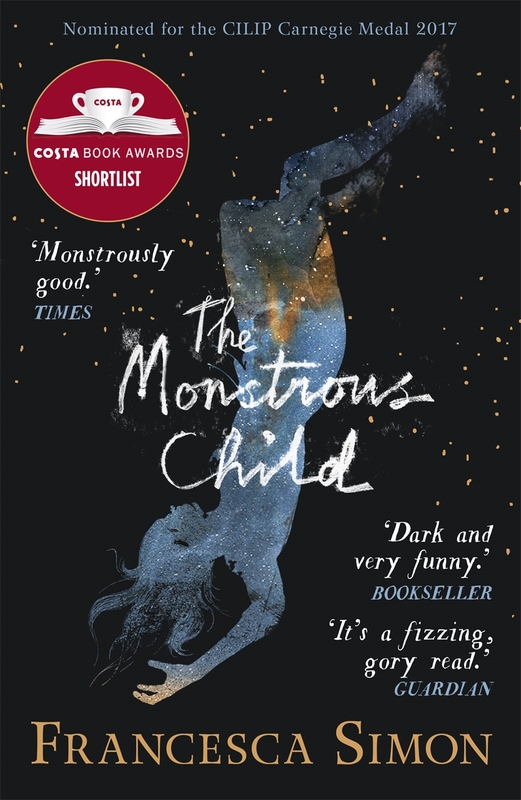 Seriously, I thought I was reading a novel for a while, the storytelling aspect of the book is that good. (Clearly I missed the subtitle on the cover, The Story of the Recycled Orchestra of Paraguay.) 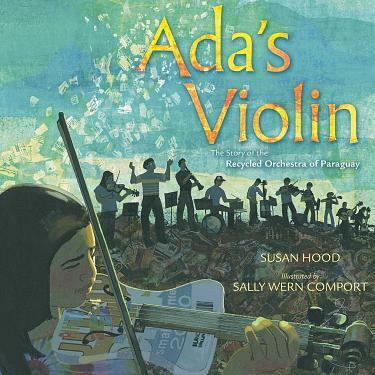 I've seen Ada's Violin mentioned this past year, but I had no idea what it was about. Then I saw it on The Green Earth Book Award short list. 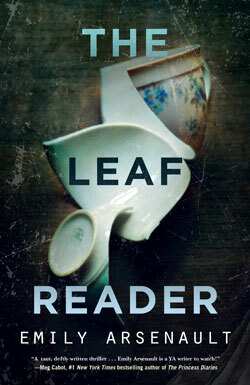 An example of an award bringing readers to a book. In my humble opinion, that's a major function of awards. The whole awarding part...eh. Okay, so what is Ada's Violin about? "Ada Rios grew up in a town made of trash." Her family works for the landfill where recyclers pick through the garbage, looking for cardboard and plastic they can sell for five or ten cents a pound. Not a bright and cheery situation, but this isn't a grim story. Ada and her grandmother are interested in music, and grandma signs her up for music lessons. Ada decides she'll learn the violin, but there aren't enough instruments for all the kids who want to play. So the music teacher gets together with a carpenter and a few other guys who find some stuff in the landfill and tinker with it and create a recycled orchestra. For real. What's terrific about this story is that there is no artificial conflict between child characters and environmental bad guys. Ada lives within an unusual environment and that environment is used as the setting for this story. In reality, it was the setting for this story. Environment as setting, and setting as a major factor in action. Hmm. I need to remember to use this book as an example in a workshop I do. 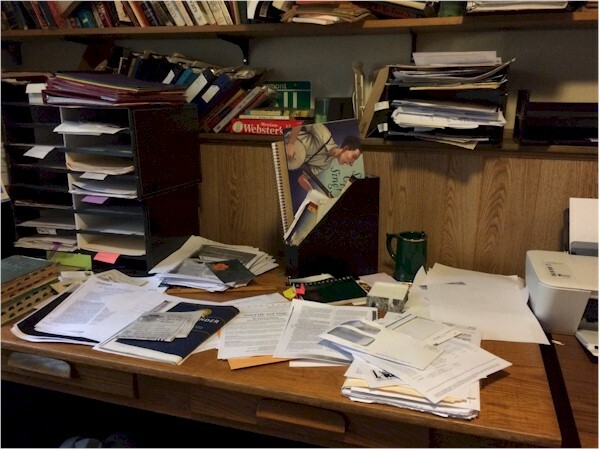 So, in my last TMT post, I wrote about whether slowing down could improve writers' productivity and how most of what I found written on the subject seemed to be more about the amount of work people did, not working slower. I didn't see how people could work more slowly without doing less. So this week I'm forgetting speed and angsting on whether we can improve productivity by actually, yes, doing less. Yeah, wouldn't that be great? While I found material about improving your work situation by working less, I didn't see a lot about how to do it. A shorter work week would be good. Don't multi-task. Working less means less stress, more peace. I, however, need nitty-gritty how-to details. Sorry to say, the i's must be dotted and the t's crossed for me. I did find something helpful in a blog maintained by Cal Newport, author of Deep Work: Rules for Focused Success in a Distracted World. I'm talking about a post called The Einstein Principle: Accomplish More By Doing Less. I know! It sounds like exactly what I'm looking for! Newport's point in his blog post is that for a three-year period, Einstein didn't do much beyond work on his theory of relativity. (Whatever that is.) The reality is, Newport says, that we're most productive when we focus on a small number of projects. Newport actually does describe a strategy for doing less so you can do more. He calls it a productivity purge. I've been known to purge things, but Newport is talking about purging tasks. Next week I'll have some ideas for purging tasks specifically for writers. In the meantime, check out what Newport writes about how to list and analyze professional and personal tasks, analyze them, and identify which can go and which you can continue working on. What seems to me to be one of the most important aspects of Newport's productivity purge is the requirement that for a month after finishing you not start any new projects. A month is a nice unit of time, something we're always talking about working with here. With Newport's purge plan, you identify the few tasks you're going to work on and commit to them for a unit of time. Okay, so doing less to achieve more may be something we can do. 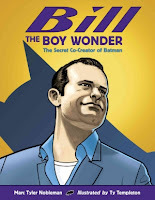 Bill Finger--The Documentary "A Big Superhero Secret"
Nearly two years ago, I heard Marc Tyler Nobleman speak about his book Bill the Boy Wonder, the story of Bill Finger, who was instrumental in creating Batman but never received credit for his work. This is the only book on Finger. Now Hulu has made its first original documentary, Batman & Bill. It's also the first documentary based on a nonfiction book for young readers, Bill the Boy Wonder. Nobleman figures prominently in the terrific trailer. The film was just released last weekend and has received a lot of media attention. Check out SyfyWire's interview with the film makers for information on children's author Nobleman's connection with the project. I loved Gemina by Amie Kaufman and Jay Kristoff, which is described on its cover as "The sequel to the New York Times bestseller Illuminae." I would call it more of a companion book, myself. It takes place in the world of Illuminae on the space station the characters from Illuminae are headed for. But we have different characters fighting for their lives now. Sort of. The Gemina story is told with documents, just as it was in Illuminae. There's another heroic, thrilling female character with a witty, male, love interest. Most of the time they are struggling separately, just as the couple in Illuminae did. And there's a medical-type problem to deal with just as there was in Illuminae. Something happens at one point that seems an insurmountable disaster, and then it's surmounted. Just like in Illuminae. I'm not complaining. I've tried to repeat early successes with later books, myself. I like the set-up in these two and look forward to reading the third book in the series. 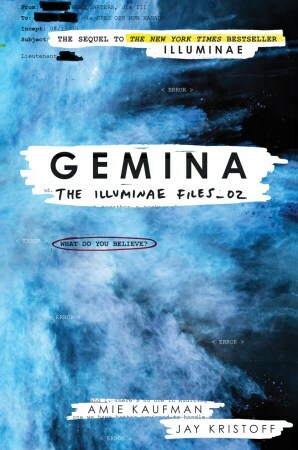 I'm going to be recommending Gemina to, and maybe buying it for, my niece, who is also an Illuminae fan. I'm just sayin' the first two books' central characters are strikingly similar, as are the books' format and story frame. Actually, I'll be kind of disappointed if the author doesn't repeat the formula with the third book. Strange Fruit: Billie Holiday and the Power of a Protest Song by Gary Golio and Stand Up and Sing! 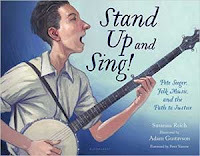 Pete Seeger, Folk Music, and the Path to Justice by Susanna Reich just happened to be published this spring, during a period when we're hearing more about protest than we have in a very long time. But how much protest are we hearing in the form of music right now? Last month, CNN did a piece on the history of protest music that included both Billie Holiday's Strange Fruit and the Peter, Paul, and Mary version of Pete Seeger's If I Had a Hammer. It brought protest music up to the present with work by Lady Gaga and Kendrick Lamar, though I don't know if any protest performers of the last few decades have the safe, middle American popularity of Peter, Paul, and Mary. (Lady Gaga's getting there). We no longer have the bulk of the American public watching just three TV networks now or much in the way of variety shows that showcase musicians. A modern Peter, Paul, and Mary doesn't have a platform, like The Smothers Brothers Hour or, earlier, The Jack Benny Show, ready for them to get a message out to a big audience. You know where you do see ready-made platforms for protest? On late-night political comedy shows. I'm going to suggest that that is where we're seeing protest this spring. As someone I discussed this with pointed out, it takes a while to create a Strange Fruit or an If I Had a Hammer, certainly longer than it takes comedy writers to react to today's news. Then the song writers, composers, and musicians face the same problem writers do--how do they get their work out before the public? Today's political comedy protest also looks different from the protest music of the past. In How Late Night Comedy Fueled the Rise of Trump Caitlin Flanagan argues that "Sneering hosts have alienated conservatives and made liberals smug." She talks about the tone of these shows--"one imbued with the conviction that they" [the hosts] "and their fans are intellectually and morally superior to those who espouse any of the beliefs of the political right." That's not what we got in a folk protest song like If I Had a Hammer. That song is about the individual creating a better world. The hammer is a creative tool, not a weapon. Even in Strange Fruit, a song that makes listeners uncomfortable, we don't hear an attack. It's more a document that pays witness to tragedy. "This is happening people. Look at this. Don't pretend you don't know." Why are we expressing protest so differently now? 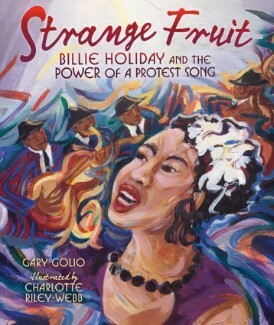 I'm giving away another nonfiction picture book this month, this one Strange Fruit: Billie Holiday and the Power of a Protest Song by Gary Golio with illustrations by Charlotte Riley-Webb. You'll find details at the end of this post about how to enter for a chance at my copy. The "strange fruit" in the title refers to the bodies of black men left in trees after having been lynched. It's the name and subject matter of a song singer Billie Holiday first performed in 1939. "Southern trees bear a strange fruit...Black body swinging in the Southern breeze." Grim subject matter for a book its publisher is marketing for ages 8 to 12? 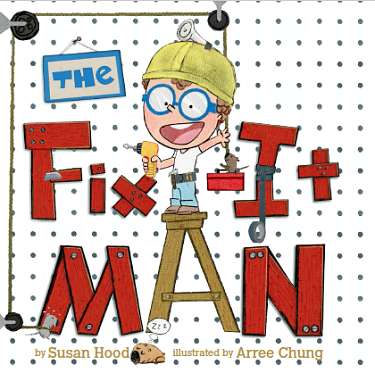 Check out the title of the book again. "Billie Holiday and the Power of a Protest Song." The book really is about Holiday and the song, Strange Fruit. Lynching is mentioned very briefly in the text and at greater length in material at the back of the book. But Strange Fruit the picture book is about Holiday's life up to the point at which she is offered the opportunity to sing Strange Fruit the song, a piece she wasn't all that taken with at first. A song that ended up having great significance. A song, by the way, that I'd never heard of until I saw this book. I don't know how I missed it. Holiday's version is in the Grammy Hall of Fame and the Recording Industry of America and the National Endowment for the Arts named it a Song of the Century. Today you can still listen to Billie Holiday, herself, sing it. You can hear an extensive number of cover versions. I listened to these before I read the picture book and enjoyed imagining white patrons in a club slowly recognizing what the song is about. (Strange Fruit: The First Great Protest Song in The Guardian deals with that very situation.) I've recently learned that the composer of the song, Abel Meeropol, became the adoptive father to Ethel and Julius Rosenberg's sons after their parents were executed. That has nothing to do with Strange Fruit, of course, but it totally blew me away. I won't go so far as to say that this is a song that young people should know about or need to know about. Instead I will say that this is a song that is very worthy of being known. This book is an opportunity to show kids one of the many ways that art matters. By the way, author Gary Golio has a little bit to say about jazz and jazz singers in this book. Very helpful for those of us who aren't terribly knowledgeable about that subject. At the end of May, I'll collect all the comments and new follows, assign everyone a number, and draw a winner. Remember, if when you comment here your name in the comment doesn't link back to an e-mail so I can contact you, I won't be able to let you know you won. (I should be able to reach you if you enter by following me on Twitter.) So check Original Content the beginning of next month to see what happened. If I can't contact the winner, and don't her from him/her in a week, I'll draw another name. Also, Comment Moderation kicks in after a few days. I'll see your comment, and post it. Coming Wednesday: More on Strange Fruit and protest. FTC Transparency Info: I received a copy of this book from the publisher.